Based on an official letter, dated 20th April 1952, SAMA was established on 04th October 1952 corresponding to 14th Muharram 1372AH. SAMA has been playing a crucial role in the consolidation and development of the Saudi financial system . At the time of its establishment, the Kingdom did not have a monetary system exclusively of its own. Foreign currencies circulated in the Kingdom as a medium of exchange, along with Saudi silver coins. Saudi bank notes had not yet been issued. There was no Saudi bank in existence and the banking business was being conducted by foreign bank branches. One of the foremost tasks of SAMA in its early stage was, therefore, the development of a Saudi currency. SAMA also paid special attention to the need for promoting the growth of a national banking system. From 1960 to 1972, SAMA focused on banking regulations against the background of expanding banking business and the Kingdom’s acceptance of full convertibility of the Riyal in March 1961 in accordance with the Article VIII of the Articles of Agreements of the IMF. From 1973 to 1982, SAMA’s preoccupation was to contain inflationary pressures in the booming economy, expansion of the banking system and manage the massive foreign exchange reserves. From mid 1980s, SAMA’s priorities have been to introduce financial market reforms. Over the years, with the growth of the economy and expansion of the financial system, SAMA’s responsibilities have increased several folds. Issues national currency, the Saudi Riyal. Acts as a banker to the government. Manages Kingdom’s foreign exchange reserves. Conducts monetary policy for promoting price and exchange rate stability. Promotes the growth and ensures the soundness of the financial system. SAMA maintains a Museum of international standard exhibiting antique Islamic (include coins that are rarely found elsewhere worldwide) and non-Islamic coins, modern currenies, raw materials used in currency making, pictures showing how banknotes and coins are printed and minted and security features in banknotes. The Museum is located at the head office's building in Riyadh, Al-Ma’ther Street, where it is opened for official visitors (with special permission) during the regular working hours. This Museum consists of five halls. For any inquiry email: vaults_issue@sama.gov.sa. Saudi Arabian Monetary Agency (SAMA) was established in the Era of King Abdulaziz, under two royal decrees issued on 25/7/1371H (20/4/1952). The first was No. 30/4/1/1046 provided for establishing the Saudi Arabian Monetary Agency, its venue in Jeddah, and opening branches in cities and places as deemed necessary. The second Decree No. 30/4/1/1047 provided for the approval of the Charter of the Saudi Arabian Monetary Agency, attached to the decree, and ordering its implementation. On 23/10/1371H (15/07/1952), Mr. Rasim Al-Khalidi was appointed as Vice Governor. On 14/11/1371H (05/08/1952), Royal Decrees Nos. 30/4/1/1743 and 30/4/1/1744 were issued, providing for the appointment of Mr. George A. Blowers (U.S. citizen) as the first governor of SAMA, and the formation of SAMA's first Board of Directors. SAMA began practicing its business in Jeddah on 14/1/1372H (04/10/1952). SAMA opened a branch in Makkah on 10/7/1372H (26/3/1953), followed by another one in Al-Madinah on 15/12/1372H (19/8/1953). Mr. Rasim Al-Khaldi resigned from his office as Vice Governor as from 17/9/1373H (20/5/1954), and Mr. Ralph Standish was appointed as Vice Governor as from 10/1/1374H (7/9/1954). A Royal Decree was issued on 22/2/1374H (20/10/1954) approving the resignation of the Governor, Mr. George A. Blowers, and the appointment of Mr. Ralph Standish as Governor. Mr. Ma'touk Hasanain was appointed as Vice Governor on 1/3/1374H (29/10/1954). SAMA opened a branch in Al-Dammam on 10/3/1374H (7/11/1954), another in Taif on 8/6/1374H (31/1/1955) and a third in Riyadh on 16/6/1374H (8/2/1955). A Royal Decree was issued on 26/7/1377H (15/2/1958) appointing Mr. Abed Mohammed Saleh Sheikh as Vice Governor. Approval of the resignation of Governor Mr. Ralph Standish was issued on 28/7/1377H (17/2/1958). Between 1934, he won an MA in economics at Ismalia in Lahore, and in 1958, he became governor of the Saudi Arab Monetary Agency (SAMA). Anwar Ali had served in such challenging jobs as undersecretary in the Ministry of Finance in India, deputy undersecretary in the Ministry of Finance in Pakistan and director of the National Bank in Pakistan as well as the post with the International Monetary Fund. A Royal Decree was issued on 29/2/1378H (14/9/1958), appointing Mr. Anwar Ali as Governor of SAMA as from 12/9/1377H (1/4/1958). A Royal Decree was issued on 4/12/1382H (27/4/1963) appointing Mr. Juneid Abdul Qadir Bajuneid as Vice Governor. A Royal Decree was issued on 1/8/1392H (9/9/1972), appointing His Excellency Mr. Khaled Al-Qusaibi as the Vice Governor. A Royal Decree was issued on 12/11/1394H (26/11/1974) appointing Mr. Abdulaziz Al-Quraishi as the Governor, the first Saudi to occupy this position. At the end of 1398H (1974), the headquarters of SAMA was relocated from Jeddah to Riyadh. Mr. Khaled Al-Qusaibi was retired pursuant to a Royal Decree issued on 8/5/1400H (25/3/1980), and H. E. Mr. Hamad Bin Saud Al-Sayari was appointed as the Vice Governor in accordance with another Royal Decree issued on the same day. On 14/6/1403H (28/3/1983), a Royal Order was issued, relieving H.E. Mr. Abdulaziz Al-Quraishi from his post upon his request as of the 1st of Rajab 1403H. Another Royal Decree was issued on the same day entrusting the duties of the Governor to Mr. Hamad Al-Sayari in addition to his original post. The early banknotes during King Fahad's reign are clearly indicated by the fact that they are having signature of Mr. Hamad Al-Sayari as "on behalf of SAMA Governor" from 14 Apr 1983 to 29 Sep 1985. Al-Sayari is also chairman of the board of directors of the Saudi Arabian Monetary Agency and member of the board of the Public Investment Fund, and Gulf Investment Corporation. Mr. Sayari is a member of the Supreme Economic Council. Before taking this post, he served as the Controller General and Vice Governor. He has a Master degree in Economics from University of Maryland, College Park, USA. On 16/12/1405H (1/9/1985), work officially started at new SAMA Headquarters in Riyadh. On 16/1/1406H (30/9/1985), a Royal Decree was issued appointing H.E. Mr. Hamad Al-Sayari as the Governor of SAMA. On 22/10/1408H (6/6/1988), a Royal Decree was issued appointing H.E. Dr. Ahmad Abdullah Al-Malek as the Vice Governor. In Ramadan, 1410H (April, 1990), SAMA established the Saudi Payment Network (SPAN), aiming at encouraging the use of E-transactions provided by the banking system. A Royal Decree was issued on 28/2/1416H (26/7/1995) appointing His Excellency Dr. Ibrahim Bin AbulAziz Al-Assaf as the Vice-Governor. He remained in this position until 25/5/1416H (19/10/1995) where he was appointed as a state minister and a member in the Council of Ministers. A Royal Decree was issued on 22/6/1416H (15/11/1995), appointing His Excellency Dr. Mohammad Bin Sulaiman Al-Jasser as the Vice-Governor. The Saudi Arabian Riyal Interbank Express Electronic System (SARIE) was launched on 18/1/1418H (14/5/1997). On 21/7/1420H (30/10/1999), His Excellency, the Minister of Finance issued a resolution entrusting SAMA with licensing, controlling and supervising financial leasing companies. The supervision of insurance sector was entrusted to SAMA by virtue of a Royal Decree issued on 2/6/1424H (31/7/2003) approving the Cooperative Insurance Companies Control Law. Effective from 13/5/1425H (1/7/2004), the supervision of the Stock Market was shifted to the Capital Market Authority (CMA) after the issue of a Royal Decree on 1/7/2004, appointing the board of CMA. SADAD Payments System (SADAD) was launched on 19/8/1425H (3/10/2004). SADAD is an intermediary system between billers and the domestic banks, facilitating and accelerating e-payment process through all banking channels in the Kingdom, including ATM, phone banking, and online banking. A Royal Decree was issued on 19/2/1430H (14/2/2009), appointing His Excellency Dr. Muharnmad Bin Sulaiman Al-Jasser as the Governor of SAMA as from 3/3/1430H (28/2/2009). A Royal Decree was issued on 9/9/1430H (30/8/2009) appointing His Excellency Dr. Abdurrahman Bin Abdullah Al-Hamidy as the Vice Governor of SAMA. Dr. Al-Mubarak was the co-founder and shareholder of Amwal AlKhaleej, a leading alternative investment firm. He has resigned from Amwal’s board of directors to take on his new role. A Royal Decree was issued on 18/1/1433H (13/12/2011), appointing His Excellency Dr. Fahad Al-Mubarak as the Governor of SAMA. Although paper currency from abroad was used along the coast, the main medium of exchange in the interior was the Maria Theresa dollar, a large silver coin minted in Europe but still bearing the profile of the Holy Roman Empress, the flamboyant Imperial Seal of Austria, and the date, 1780. This coin was also counter marked with the words in Arabic "Nejd" and "Hejaz". Until oil was discovered, income was derived mostly from customs duties on imports and the income from tens of thousands of pilgrims who poured into Jeddah every year en route to Mecca. The only fluctuation in the economy occurred when the pilgrims arrived. And without them and their small hordes of gold and silver coins, Indian rupees, British pounds and Dutch guilders the country would have been hard pressed to find extra money for imports. Money changers abounded in the pilgrimage centers, but until 1948 there was only one bank in the country, the Netherlands Trading Society (now operating as Saudi Hollandi Bank), which had been established in Jeddah in 1926. Its main business at the time was providing financial services to Haj pilgrims from Indonesia. As it was the only bank in the Kingdom at the time, it acted as the central bank, keeping the Kingdom's gold reserves and receiving oil revenues on behalf of the Saudi Arabian government. In 1928 the Saudi Riyal, a new silver coin commissioned by Late King Abdulaziz, became the Kingdom's first independent currency. The Netherlands Trading Society office in Jeddah had the honour of assisting the government with the launch of the local currency. However, although the Hejaz riyal was the same weight as the Ottoman 20 kurus, it was minted in .917 fineness, compared to .830 fineness for the Ottoman coin. In 1925, however, the year after King Abd al-'Aziz consolidated the country by conquering the Hejaz. The government did attempt to establish a national currency by issuing its first coin. It was made in copper or bronze the 1/4 and 1/2 qirsh dated between 1343-1344 AH, minted in Mecca, known as transitional coinage. Two years later the silver riyal based on Hejaz's Riyal metal composition was issued but was valued at 22 qirsh carrying the title "King of Hejaz and Sultan of Nejd". Two years later the royal title was changed to "King of Hejaz and Nejd and Dependencies" and coins were issued in denominations of ¼, ½ and 1 ghirsh in cupro-nickel and ¼, ½ and 1 riyal in silver, same denominations as in 1926. The exchange rate of the riyal was established at 10 riyals for each British gold sovereign, the gold coin circulating most widely in the Kingdom at that time. This remained the system of currency even though the riyal was subsequently debased to a coin equivalent in silver content to the Indian rupee in 1935. At this value, unfortunately, the Saudi riyal was a "full-bodied" coin. That is, the market value of the silver it contained was approximately equal to the official rate at which the government would accept it in exchange for gold. Money changers and merchants were quick to notice this. When the world price of silver rose so high that the value of metal contained in the riyals exceeded the official exchange value of the riyal, they were equally quick to exchange gold and other currencies for silver riyals, then melt the riyals and sell them as bullion to silver brokers. At such times, silver riyals disappeared from circulation. The Kingdom's first detailed government budget, published in April, 1948 proved unworkable because the value of the Saudi riyal in which the budget was expressed was constantly changing in terms of the numerous foreign currencies which circulated widely in the country, and the values of these currencies were constantly changing in relation to one another. In addition, oil income was paid in gold or foreign exchange, but about half of the government's expenditures for its payroll were met with silver riyals, and riyals were frequently in short supply. The rates at which riyals and qirsh were exchanged for one another varied from time to time and from place to place. Even the country's geography conspired to force change: because of the vast distances and poor communications between the oil producing area, the country's administrative capital and the financial center, the development of orderly financial transactions was almost impossible. Nor did the general absence of banks help. Although by 1948 a number of foreign banks had begun to open branches in the main centers of commercial activity Jeddah and the Eastern Province there were to be no banking facilities elsewhere in the country for another five years. 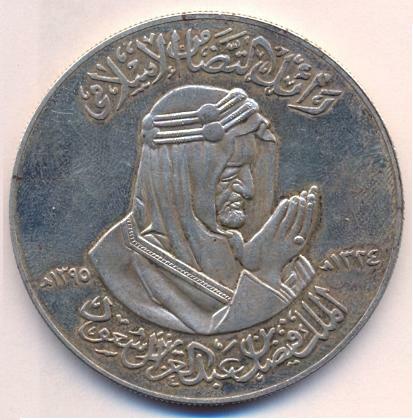 In 1935, the first coins were issued in the name of Saudi Arabia. These were silver ¼, ½ and 1 riyal coins which were nearly 50% lighter than the previous issue. Cupro-nickel ¼, ½ and 1 ghirsh were also issued from 1937. In 1939 the company that would become the Arabian American Oil Company (Aramco) made its first oil payments to the Saudi Arabian Government. They were the first of the revenues that would later change the Saudi economy so drastically, but at the time they were of minor importance, certainly insufficient to offset the economic decline that set in as World War II got under way. Income from pilgrimage virtually ceased and interruptions in shipping caused critical shortages in food and clothing. The U. S. government helped 'by extending lend-lease aid in the form of 9.3 million ounces of silver, minted into 25 million Saudi riyal coins, but by early 1944, the economy of Saudi Arabia was still in a state of suspended animation. It was a period of breathless calm before the onset of the tumultuous changes which, within two decades, would reshape the whole economy of the country. The changes actually began in 1945 with the expansion of oil production, the injection of large amounts of cash into the economy, and the expansion of the government's payments and purchases. Capital investments in the oil industry stimulated a demand for local wage labor in the Eastern Province and created markets for large quantities of imported equipment and construction materials. This activity in turn generated the need for port facilities, airports, storehouses, roads, and other supporting physical facilities. The demand for money for cash, that is soared. The Saudi Government believed that the only proper way to meet the increased demand for money was to put more gold and silver coins into circulation. U.S. Philadelphia Mint for Aramco, issued 4 sovereign gold coins each having a weight for each coin of 31.95g .917Au from 1944 to 1945 for its oil revenues, packed in kegs and flown to Jeddah every month. In 1947 1 sovereign gold coin, 7.9881g .917Au were also issued on the behalf of Aramco for Saudi government. The Saudi government also placed with the U.S. Mint a succession of orders for millions of full-weight, Arabic-inscribed Saudi silver riyals along with reeded (milled or segmented) edge coins of Cupro-nickel ¼, ½ and 1 ghirsh with frozen date 1345 AH (1937) in 1947. In 1946 (1365 AH), many of the cupro-nickel coins were countermarked with the Arabic numerals 65 in what Krause and Mishler describe as "a move to break money changers' monopoly on small coins". In 1950 the government, still convinced that "hard" money was the only good money, had decided to meet the country's growing need for currency by issuing its own gold coin. 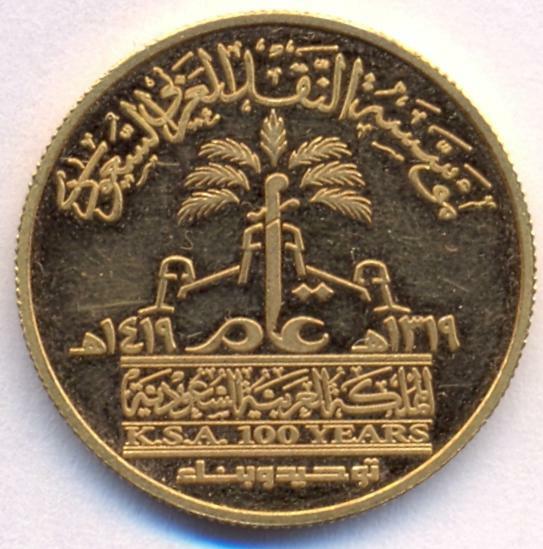 The coin, called the Saudi sovereign, was practically identical in weight and fineness to the British sovereign and was made full legal tender, It could be freely exchanged by SAMA at the rate of 40 silver riyals (nearly eleven dollars) per sovereign, and gave Saudi Arabia a full, bi-metallic money standard. Like other countries that had tried and abandoned it, Saudi Arabia's experience with a bi-metallic standard was not a happy one, and for the same reason: the world market prices of gold and silver do not remain in constant proportion to one another and even minor changes in the world market prices of the metals are sufficient to drive coins of one or the other metal out of circulation. In Saudi Arabia, the silver in the riyal eventually became more valuable as silver than as money and wound up in foreign bullion markets. The gold in the sovereigns, on the other hand, was more valuable in sovereign form than as gold, which encouraged counterfeiters. Soon after the issue of the gold sovereign, counterfeiters began to reproduce large numbers of full-weight coins which only a few experts could distinguish from the genuine ones. The spread between the value of the gold sovereign (nearly $11) and the world market value of the gold in the sovereign (about $9) was not much, but it was sufficient to provide counterfeiters with an adequate incentive to meet the risks and costs of stamping, transporting, and circulating the coins. By 1951 the government realized that it needed to set up a more orderly monetary system. It also realized that this meant creating an administrative apparatus able to channel into the economy enough money to fuel business activity yet avoid inflation. It would also have to insure that the rapidly increasing oil revenues be used in accordance with the government's wishes. Accordingly, in the summer of 1951, the government brought in a team of foreign financial experts, backed by the U.S. Point Four Program, to draw up a program of monetary reform. The main features of this program were implemented in October, 1952, when the Saudi Arabian Government announced the formation of a modified central bank, It was called the Saudi Arabian Monetary Agency (SAMA). The pilgrim receipts, freely exchangeable for silver riyals and entirely backed by silver held in government vaults, were an immediate success. Furthermore they quickly came into general use throughout the Kingdom, for they were well made and durable, difficult to counterfeit, and far more convenient to handle. They also filled an important gap in the national currency system, which hitherto had no denomination between the riyal and the 40-riyal sovereign which was rather like an American trying to do all his shopping with only silver quarters and 10-dollar gold pieces. By the end of 1954, more than 150 million riyals worth of pilgrim receipts were in circulation and were rapidly displacing both the gold sovereign and the silver riyal as the principal medium of exchange. In 1956, when the silver riyal was becoming scarce, one-riyal pilgrim receipts were also issued. Cupro-nickel 2 and 4 ghirsh were introduced in 1957. In 1957 the economy of Saudi Arabia was skidding dangerously. Inflation was out of control. The value of the Saudi riyal had slipped to half what it had been. Oil revenues were down some $50 million and the government was nearly half a billion dollars in debt. It based on three factors, first ordering additional (over limit) pilgrim's receipts, secondly normal reaction of all individuals who hold a currency which is weakening: they exchange it for other currencies, or for gold, jewelry or merchandise. Thirdly Suez Crisis - The Sinai War (Arab-Israeli conflict) from 29 October 1956 to March 1957, in which oil production fell off sharply. Crown Prince Faisal ibn Abd al-Aziz Al Saud, then Viceroy and Prime Minister, in October, 1957, engaged two financial experts to design and implement a program of fiscal and monetary reform. The experts were Ahmed Zaki Saad, an executive director of the International Monetary Fund, and Anwar Ali, director of the Middle East department of the IMF. By early 1958 it had plunged from the official rate of 3.75 riyals to the dollar to an all time low of 6.25 riyals per dollar. On December 31, 1959, the government announced devaluation of the riyal from 3.75 per dollar to 4.50 per dollar, the then prevailing free market rate. But to head off a sharp rise in the prices of food staples and drugs, hitherto licensed for import at the official exchange rate, the government also authorized subsidy payments to importers of these goods in order to offset the foreign exchange loss caused by devaluation. Although other licensed commodities, including clothing and capital goods, were not included in the subsidy program, the general decline in economic activity caused by the government cutback in spending prevented their prices from increasing. The devaluation of the riyal was followed and the Saudi gold sovereign was withdrawn from circulation, and provision was made to replace the old pilgrim receipts with a full-fledged paper currency. The paper money was issued in 1961 against a 100 per cent reserve of gold and convertible foreign exchange (mainly American dollars) held on behalf of SAMA. As for the silver rivals, most of them had long since disappeared into foreign bullion markets. In 1960, the system was changed to 20 ghirsh = 1 riyal and this was followed in 1963 by the introduction of the halala, worth one hundredth of a riyal. Some Saudi coins still bear denominations in ghirsh but this denomination is no longer commonly used. In 1963 the situation had changed beyond belief. The national debt had been paid and economy improved rapidly throughout the kingdom. Ever ever since it has been one of the few countries in the world with no national debt. Anwar Ali, SAMA governor played an vital role in the stability of the country's economical situation. The country is also attempting to diversify its economy in order to reduce its dependence on oil. The autonomous government agency, Petromin, has entered into agreements with foreign firms for the production of fertilizers and sulphur for export from the country's extensive natural gas resources. An extensive program of mineral exploration is under way. Teams of foreign experts are engaged in a detailed nationwide survey of the country's underground water resources as part of a comprehensive program for developing agriculture, thus reducing the country's dependence on imported foodstuffs. Numerous systematic feasibility studies of industrial development possibilities are in process. Year: 1976. 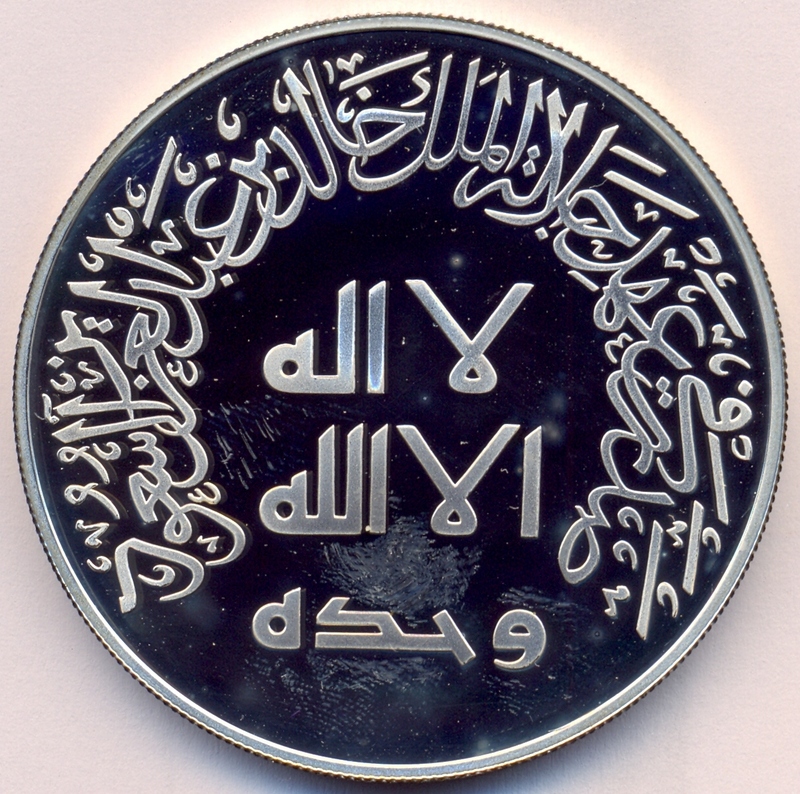 Obverse: Issued during the reign of King Khalid bin Abdul Aziz Al Saud with SAMA logo. Reverse: 25 years of SAMA establishment 1372 - 1397 AH. [corresponding to 1952 - 1977] - Portrait of the founder of Saudi Arabia: King Abdul Aziz bin Abdul Rehman Al Saud. Weight: 60.25g Fineness: .925Ag. A gold coin with the same design was also produced with weight 50.00g and fineness: .917Au. Year: 1976: Another silver and gold coin based on the above composition were also created, but without any date and SAMA name / logo. Obverse Legend: In the memory of great ambassador of Muslim world, King Faisal bin Abdulaziz Al-Saud (1324 - 1395 AH) upon his first death anniversary. Reverse shows the external view of Holy Mosque from one of its gate in Makkah. 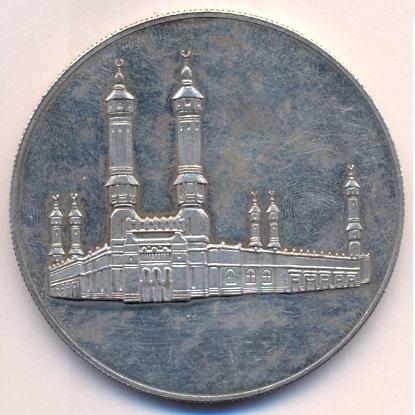 Note: A similar coin also exists with .925Ag fineness and mint stamps, below the Holy Mosque, which is not issued by SAMA. Year: 1984. 31.95g .917Au. 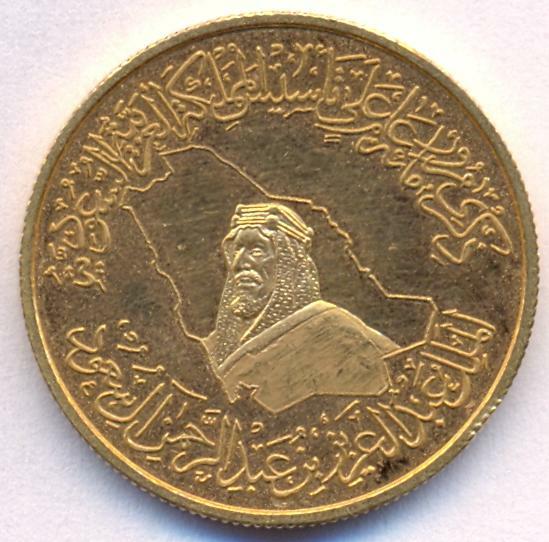 Obverse: King Fahad bin Abdulaziz Al-Saud portrait facing left with legend of his title: Khadim al-Haramayn ash-Sharifayn. [Custodian of the two Holy Mosques]. Reverse: showing prophet Muhammad's mosque at Medina and date of expansion of this mosque: 09 Safar 1405 AH [corresponding to Saturday 03rd Nov 1984]. Weight: 50.00g and fineness: .917Au. Year: 1986. 31.95g .917Au. Obverse: Quran; Chapter#3, Verse# 103: And hold fast, all together, by the rope which Allah (stretches out for you), and be not divided among yourselves;... Portrait of Sheikh Isa bin Salman Al-Khalifa on the left and King Fahad bin Abdulaziz Al-Saud on right. Issued by: Saudi Arabian Monetary Agency. Reverse: Bahrain Saudi Causeway 1986 with corresponding year: 1406 AH with a picture of the bridge. Weight: 30.00g and fineness: .917Au. Note: A similar coin has also been issued by Bahrain with same design, weight, fineness and pictures. The only difference is "Saudi Bahrain Causeway", 1986 corresponding year: 1407 AH and Issuer: Bahrain Monetary Agency. Year: 1999: Obverse: This coin was issued on 05th Shawal 1419 AH corresponding to 23rd Jan 1999. Celebrating the 100 years of Kingdom of Saudi Arabia 1319 - 1419 AH with displaying the official logo of this occasion. Reverse: Portrait of the founder of Saudi Arabia: King Abdul Aziz bin Abdul Rehman Al Saud, who recaptured Nejd on 05th Shawal 1319 AH [corresponding to Wednesday 15th Jan 1902]. Weight: 8.00g. Diameter: 22mm. Edge: Reeded. Fineness: .9167Au. Mintage: 15,000. Mint: Monnaie de Paris with approval of French mint director: Emmanuel Constans and SAMA governor: Hamad S. Al-Sayari. Struck from the gold extracted from Saudi gold mines. The same gold coin was also produced in weight: 30.00g, diameter: 36mm with same gold fineness and has a total mintage of 10,000. Year: 2001 (AH 1422): 20th Years of rule of the Custodian of the two Holy Mosques. Weight: 31.10g. Diameter: 36mm. Edge: Reeded. Fineness: .9167Au. Mintage: N/A. Mint: Monnaie de Paris. Year: 2001 (AH 1422): 50th Years of the establishment of SAMA. SAMA logo in gold (inner ring). Weight: 122.00g. Diameter: 50 mm. Edge: Plain. Fineness: Outer ring 0.925 Silver and inner ring 0.9167 Gold (bi-metallic). Mintage: N/A. Mint: probably Monnaie de Paris. 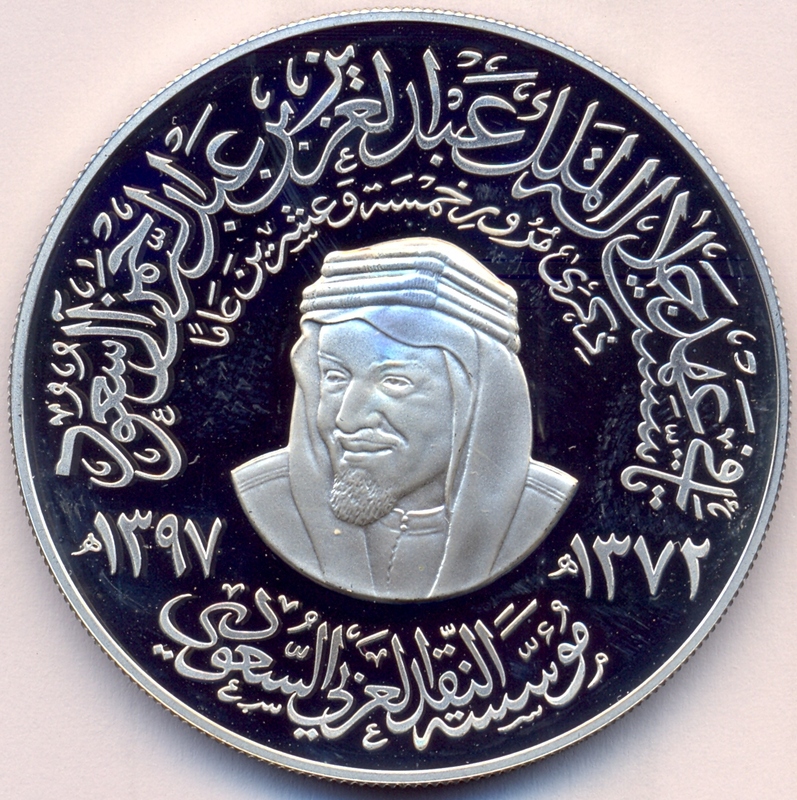 Year: 2008: The Saudi Arabian Monetary Agency (SAMA) has issued this medallion on the occasion of the completion of 75 years since the establishment of Saudi Aramco (1933-2008). Issued Year: 2008 (AH 1429). Weight: 31.10g (one ounce). Diameter: 40mm. Edge: Reeded. Fineness: .999 Silver. Mintage: N/A. Mint: unknown. In 1933, during the reign of HM King Abdulaziz Bin Abdulrahman Al Saud, the Kingdom of Saudi Arabia granted oil concession and in 1936 the drilling began in Dammam Well no. 7. The Custodian of the two Holy Mosques, King Abdullah Bin Abdulaziz Al Saud, renamed it "Prosperity Well" in 2008, since it was the first well to produce oil commercially in Saudi Arabia. The same coin is also produced with 0.917 gold standard in 8.00g with diameter 22mm and 31.10g with diameter 40mm. Both these coins are also having reeded edge. The Kingdom became familiar with paper currency (banknotes) only after the establishment of SAMA. Its first experience with this type of currencies was the issuance of pilgrim receipts which were issued at first in the denomination of 10 riyals only. The value of the banknote was inscripted in various languages: Arabic, Turkish, Persian and Urdu. It was put in circulation on 14/11/1372 AH (25/7/1953). Another variant of this pilgrim receipts was introduced and put in circulation on 15/9/1373 AH (18/5/1954). The denomination of 5 Riyals pilgrim receipts was issued on 13/10/1373H (14/6/1954) and the first edition of one-riyal pilgrim receipts was issued on 23/11/1375H (2/7/1956). All pilgrim receipts were withdrawn from circulation on 30/9/1384 AH. Under the Royal Decree No. 6 dated 1/7/1376 AH, pertaining to the issuance of the official currency, the first issue of banknotes in the denominations of 100, 50, 10, 5, and 1 riyal was put in circulation on 01/01/1381 AH (14/6/1961). This issue was withdrawn from circulation on 1/5/1391 AH. they continued in circulation side by side with the silver riyal minted by SAMA in 1384 AH, and King Saud’s gold sovereign minted in 1377 AH. The second issue of bank-notes was put in circulation on 15/11/1387 AH, corresponding to 13/03/1968 CE. It was withdrawn from circulation on 01/07/1400 AH. The third issue was placed in circulation on 16/10/1396 AH, corresponding to 09/09/1976 CE. The fourth issue under Royal Decree No.6 dated 01/07/1379, which was placed in circulation on 01/04/1404 AH included the new 500 riyals banknote to meet the expanding volume of transactions. On the occasion of celebrating the centennial of the kingdom of Saudi Arabia, which corresponds to the 5th of Shawwal 1419 AH (23rd Jan 1999), the Saudi Arabian Monetary Agency issued two new banknotes in denominations of SR.200 and SR.20. These banknotes will bear the logo of the Centennial in addition to other Islamic and historical features and will be printed using the latest technology with regards to technical aspects and security features. "May Allah, the Almighty, help us in our efforts towards the prosperity of our beloved country under the leadership of the Custodian of the Two Holy Mosques and the Crown Prince". 500 & 100 banknotes were replaced in July 2004 with new security features. These banknotes are still in circulation to the current date. However, it could be exchanged for the current issue at SAMA and its branches only. The 5th Issue of banknotes pursuant to Article (4) of the Saudi Currency Law, issued under the Royal Decree No. (6) and dated 1/7/1379 H. were printed in the reign of the Custodian of The Two Holy Mosques, King Abdullah Bin Abdulaziz Al Saud. The new issue included six denominations: One Hundred and Fifty Saudi Riyal denominations were available at SAMA branches as of Monday 04/05/1428 AH (21/05/2007 CE), followed by both the Ten and Five Saudi Riyal denominations in the beginning of Rajab 1428 AH (July 2007), followed by the Five Hundred denomination in the beginning of Ramadan Al Mubarak 1428 AH (September 2007), followed by the One Riyal after Eid Al Adha Al Mubarak 1428 AH (December 2007), and will be equally legally binding side by side with the other Saudi banknote denominations currently in circulation. The new issue is characterized by various technical specifications and security features implemented by the most modern techniques used in banknote printing industry. Madaf Al-Omlaat [Museum of Currencies] issued by SAMA - Page 280-281. The miracle of Money by Dr. Thomas W. Shea at http://www.saudiaramcoworld.com/issue/196901/the.riyal-a.miracle.in.money.htm taken from Pages 26-33 of the January/February 1969 print edition of Saudi Aramco World. Krause publication "Standard Catalog of World Coins", 1901-2000, 36th (2009) edition. Wikipedia about SAMA at http://en.wikipedia.org/wiki/Saudi_Arabian_Monetary_Agency.